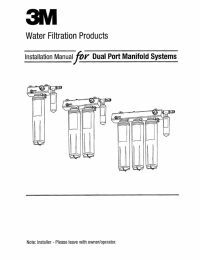 The DF290-CL Filter System was formerly labeled as Aqua-Pure DF290-CL. 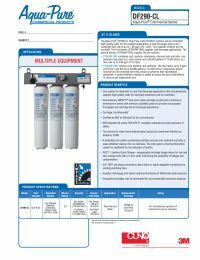 Includes two HF90-CL filter cartridges and one HF90-S-SR5 filter cartridge. Stream One combines cyst, bacteria, chloramine, chlorine taste and odor and sediment reduction for a total volume up to 25,000 gallons at a flow rate of 2.66 gpm. Stream Two combines cyst, bacteria, and sediment reduction at a flow rate up to 5 gpm and the life of is 25,000 gallons. Chloramines, and/or chlorine are not reduced from this stream to preserve the disinfectant properties. A scale inhibition media is added to reduce the hard scale effects of calcium and magnesium ions.